The Stila Smudge Stick Waterproof Eye Liners are mechanical eyeliners that, like most, need to be twisted to release more product. As you can see from the swatches above, all six Stila Smudge Stick Waterproof Eye Liners that I own are very pigmented, with each needing just one line to be extremely opaque both as a swatch and on the eye. Damsel is a matte chocolate brown and Stingray is a matte black. Navy is a shimmery deep blue. Lionfish is a deep bronze brown. Emerald is a vibrant green shade without any shimmer and Aubergine is a shimmery burgundy shade. The Stila Smudge Stick Waterproof Eye Liners are incredibly smooth and buttery in texture, gliding onto the upper lash line, water line and tight line with ease. Once applied, you have a minute or so to work with them so they're very easy to blend out and create a smokey look if that's what you want. They also don't crease, even when blended across the whole lid, meaning that they make a great coloured base for more intense eye looks. I know that I'll be using Aubergine a lot when I pull out MAC's Cranberry eyeshadow! Once they're set, the Stila Smudge Stick Waterproof Eye Liners do not move! I don't use any colour but a flesh toned line on my waterline so I can't comment on the lasting power there, however their lasting power on my upper lash line is incredible, with no noticeable fading or, more importantly, smudging after 10 - 12 hours wear! I've also found that, even though they're very long wearing, they also can be removed quite easily using a product like MAC's Cleanse Off Oil. The Stila Smudge Stick Waterproof Eye Liners retail for $32.00 here in Australia and they can be bought from Mecca Cosmetica. Alternatively, you can pick it up from Beauty Bay for $23.00 (although they're currently on sale for $19.70). If you're living in the US, you can also pick this up from Sephora for $20.00. If you're in the market for a good quality eyeliner, I'd highly recommend you check these out! 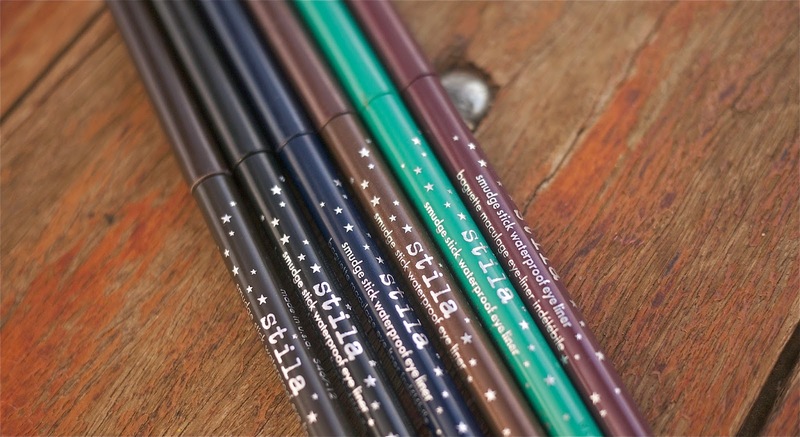 Have you tried and of the Stila Smudge Stick Waterproof Eye Liners? Which colour is your favourite from the ones I've swatched above? How would you wear Emerald? I am a fan of pencil liners because they come in so many incredible colours and I find them really easy and quick to use. I love the look of Emerald.. gorgeous!! Thank you for the review! :) I really like the look of Aubergine and Lionfish! Such cute names too. i learned to use pencil liner before anything else so i can see myself grabbing these. actually, i have a few waiting to be reviewed by i just haven't gotten around to them so thanks for this pre-insight before i give them a go.